Editing the source of a lambda procedure in AWS can be very cumbersome. Logging in with two-factor authentication and then selecting your lambda and using their web-based “IDE” with nested scroll bars going on on the page is not the greatest. Even worse is if your function actually has dependencies! Then you cannot view the source on the web and must download a zip file, and re-zip and upload it every time you wish to make a change. Naturally after a while of doing this I got pretty fed up so I created a handy plugin (documentation and source on GitHub) for my editor of choice these days, Sublime Text. 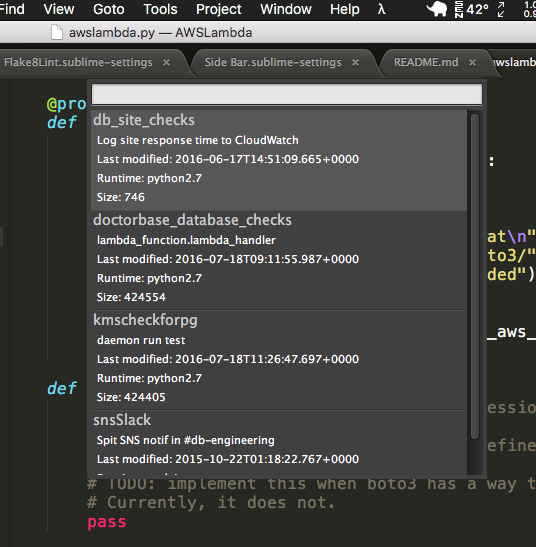 After setting up your AWS access key if you haven’t done so already (it uses the awscli or boto config) and installing the plugin via the Sublime Package Manager, you can call up a list of lambdas from within your editor. After selecting a lambda to edit, it downloads the zip (even if it wasn’t originally a zip), sticks it in a temporary directory and creates a sublime project for you. When you save any of the files it will automatically zip up the files in the project and update the function source automatically, as if you were editing a local file. Simplicity itself. How do you define a payload as input for the function? Is that possible with your sublime package? It’s not an option at present, but feel free to add the feature!